There are certain things that I definitely wanted to know before having children (the ins and outs of childbirth), things I didn’t want to know (how much they would really change our life) and things that I didn’t know, I didn’t know, but wished I would’ve known. The topic up for discussion, falls into that last bucket. It’s a message that I would love to get out to all new parents and I feel compelled to now, having just gone through it…for the 3rd and final time. A subject, about which, I rarely hear anyone discuss. It’s as simple as understanding that there’s a very difficult time with a newborn, that doesn’t last forever, but may test you, your marriage, your strength and cause you to question your sanity in your decision to ever have had a child/ another child in the first place. It’s a time period that I wasn’t aware of until we were going through it. A time that no one mentioned to us until we were in it and by then it was a little too late. I’m calling it the Six Week Boot Camp. Weeks one through six. The first brutal six weeks at home with baby. The difference for me this go around is that I mentally prepared for this time period because I KNEW how hard it would be. I KNEW it would be a huge challenge. I KNEW that I needed as much mental toughness as physical resiliency. In my mind, and I’m actually not really kidding, I pictured myself putting on a combat helmet, lacing up my boots, head down, determination strong. I had the advantage this time. I KNEW it was coming. I KNEW I could survive it. I KNEW it would get better. 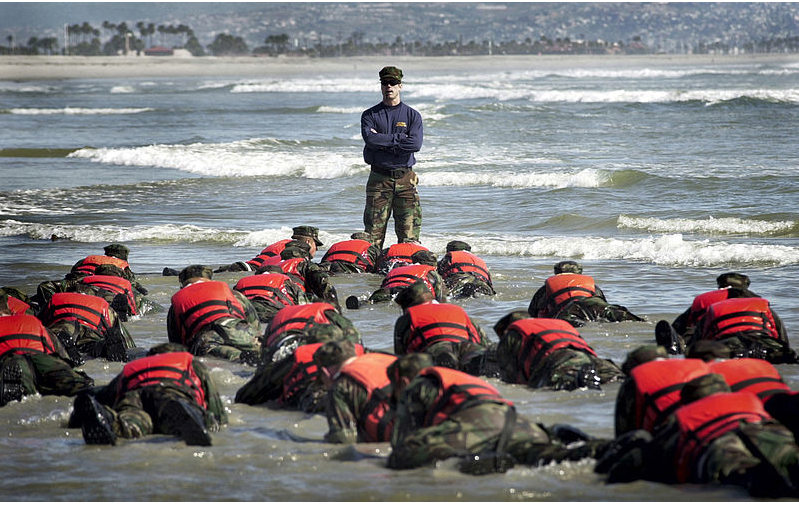 I’ve been thinking about this time in terms of Boot Camp, but more specifically, Navy SEAL “Hell Week,” the most difficult stretch of training that trainees endure on their way to becoming Navy SEALs. My husband and I are lucky enough to know a Navy SEAL. A real life warrior. I know enough about these special forces to be respectful of their accomplishments and in awe of the training process. 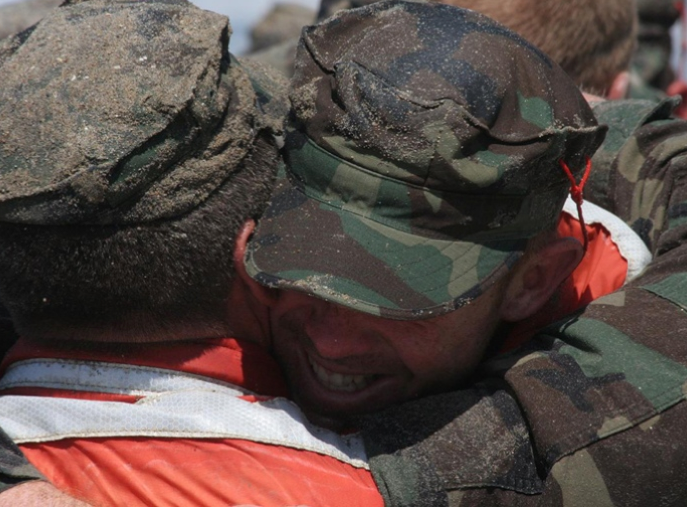 Stories about Hell Week describe it as a test of physical endurance, mental toughness, pain, ability to perform under physical and mental stress. Additionally, this 5 ½ day test takes place on fewer than 4 hours of sleep. It’s said to be the greatest achievement in a trainee’s life and leads to the realization that they can do more than they ever thought they could. To me, the parallels are striking. Yes, different in many, many ways. But, definitely relatable and true, at a high level: The conquering of a symphonic feat of physical, emotional, mental strain. I will never be a Navy SEAL. But, I have come to think of those first six weeks as the closest I will ever get to Navy SEAL Hell Week. It’s been my equivalent of Hell Week. And I’m glad that I know that now. The Navy SEALs have a motto that I think works just as well for the Six Week Boot Camp with your new babe and is oh, so appropriate for new parents to understand, embrace and remember daily: THE ONLY EASY DAY WAS YESTERDAY. The only easy day was yesterday. So, mama. Remember this: Yes. The only easy day was yesterday. Set that expectation for six weeks. You will have nights that you may not sleep at all. In fact, you will go for months without any sort of continuous night’s sleep. You may be perpetually hungry and thirsty depending on the number of children in your family, your nursing schedule, and other daily life responsibilities. You will need, in your sleep- deprived state, to conquer tasks of balance, strength and agility. You will feel the physical manifestations of the emotional stress. You will have moments when you lose your mental edge and think you can’t do any of it for one more minute. You will give up nearly everything else in your life for these six weeks. You will have moments when you would pay $100 for 5 minutes of sleep or a 10-minute shower. Your baby crying and sometimes, in conjunction with your other crying children will drive you to your own tears. You will need to draw on a depleted tank of intestinal fortitude to put one foot in front of the other. You will put on a brave face for kind visitors. You will mask your pain. But, mama, you WILL succeed. HOOYAH! You will conquer this period and come out stronger than before. It may be the hardest thing you ever do. But you will do it. And it will get better. And the fruits of your labor will be recognized. And you will, eventually, get back to being you. And, as a couple, you and your spouse will get back to being a version of the couple that you remember. And you will have fun again. And you will get sleep again. And, happily, mama, it’s actually very likely, that you will have no memory of these first few weeks. You will simply know, with pride, that you survived it all; that you can accomplish most anything else that comes your way. You are stronger than you ever thought possible. Oh Colleen….how you have captured those first 6 weeks! And thanks for reminding me that it was an accomplishment we are sure to be proud! Next Next post: When I grow up…Another “stump the band” question from the 4-year old.